Chimney fire prevention becomes even more important as we go from Fall to Winter and Chicagoland home owners light their fireplaces for the first time. The Chimney Safety Institute of America states nationwide, in 2012 there were 20 deaths, 60 injuries, $90+ million in damages all related to home fireplaces & chimneys. Naturally, you’re no expert on chimneys but keeping your family safe is the top priority & we at Elite Chimney & Masonry are all about that. 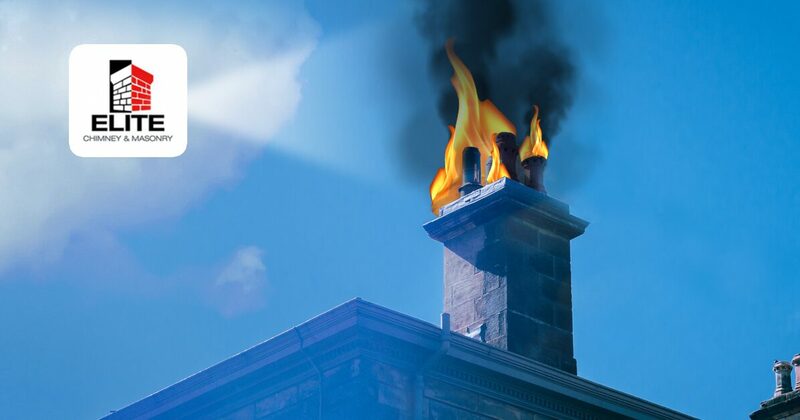 Why Did Your Chimney Catch Fire? The job of your chimney is to remove the byproducts of your fire as quickly & efficiently as possible. Over time this process slows down as more and more condensation is released into the inside of your fire place and your fires stop burning as bright as they used to. This process creates an unwanted and highly combustible residue called creosote. When this build up gets to be too much and your flue gets hot enough, a chimney fire can and will occur. How Do You Know Your Chimney is on Fire? In other words: you might see fire, you might hear it, or you may smell it. You might get some half-baked, DIY idea on what to do but honestly, when it comes to your family’s safety, we don’t recommend messing around with something as dangerous as fire & smoke inhalation. The margin of error is a lot smaller then you would imagine. If you are sensing that your chimney is on fire call 911 immediately. How Can You Prevent a Chimney Fire? The BEST way to avoid a potentially disastrous chimney issue is to schedule an inspection & cleaning with the certified sweeping professionals at Elite Chimney & Masonry. We maximize the efficiency of your fireplace. Burn dry or cured wood. Burning wet and/or uncured wood creates more of the unwanted creosote build-up we at Elite can eliminate with annual fireplace & chimney check-up. Don’t burn anything other than wood. Avoid anything with ink on it. Don’t burn garbage. Never burn plastic or metals. Just keep it simple and ONLY burn dry, cured wood. Everything else just creates unwanted build-up on the inside of your fireplace. Install a smoke alarm / carbon monoxide detector. Preferably close to your fire place in the same room. Keep the fireplace clean at all times. Never start a new fire on top of the coals or ashes of a previous burned fire. This can make your fire burn even hotter than normal where it can spark a chimney fire. Keep it tidy. Fire prevention in your chimney, or anywhere else for that matter is of upmost importance. We hope the fire prevention tips we are providing here can help take some of the stress out of maintaining a chimney & fireplace. Elite Chimney & Masonry can and will help keep your family safe with our professional chimney experts. Maximize the efficiency of your fireplace and call us at 630-343-5979 or contact us TODAY and schedule a visit. Throughout the entire Chicago suburbs area we offer free, no-hassle consultations. We are chimney fire prevention experts working to keep your family safe!